Saida has been working as a Community Health Worker (CHW) for WellShare since 2012. She holds a bachelor’s degree in child psychology and is also a licensed social worker (LSW). Saida has extensive experience in working with various cultures. She was born in Mogadishu in Somalia and raised in Nairobi, Kenya and in Minnesota. As a result Saida speaks Somali and English fluently. She is also proficient in American Sign Language. 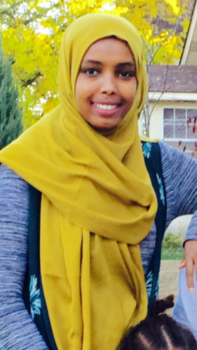 Saida chose to become a CHW for WellShare because she wanted to make a difference in the Somali community. At the moment, she spends the majority of her time at Smiley’s Family Medicine Clinic in order to improve culturally-appropriate engagement with Somali patients. In the past, Saida has worked with other WellShare programs, such as The Young Achievers (TYA), the East African Smoke-Free Program (EASFP) and the Somali Family Planning Program (SPEAK). Saida enjoys going into the communities, interacting with the patients and providing solutions and resources to make sure that individuals are getting the care they need. Doing outreach enables her to get to know the communities’ needs and barriers and, at the same time, builds relationships and trust within the communities, which is an essential part of the work as a CHW. In her free time, Saida enjoys traveling, biking, basketball, reading and painting.